We supply Screw Conveyor for all aplication. 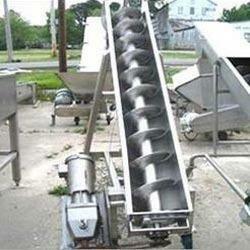 We can supply screw conveyor in MS/ SS for aplication like fly ash, rice, cement or fior any other application. We specifically design the system to suit the requirement. Screw conveyors has become popular equipment, which is used to move materials in direction, horizontally, at an inclination or vertically. With proper covers and gasketing they become weatherproof, dust tight and rodent proof. Their compact design allows them to fit easily into restricted areas that would otherwise be unsuitable for most types of bulk material handling equipment. They are simple to install and support and require very little maintenance.